For the better part of a century, researchers have been diving down a scientific rabbit hole, studying the bizarre properties of matter at the atomic scale. Over such tiny distances, classical physics breaks down, and a host of extraordinary interactions take over. 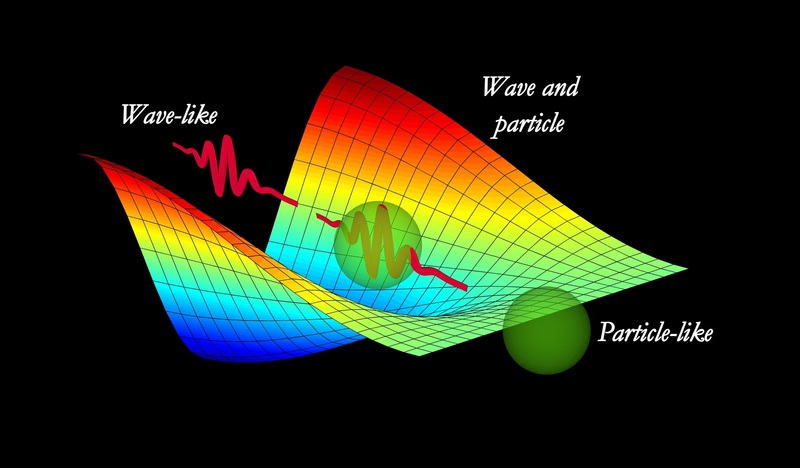 Particles take on a new flavor, displaying properties usually associated with waves. Even the way energy is transferred changes. Quantum mechanics can explain these behaviors of matter at the atomic scale and hints at vast untapped potential in a myriad of exciting applications. Developing materials and systems that allow quantum properties to transcend the atomic scale could drive new technological breakthroughs, from new ways to process data to extremely sensitive measurement techniques and more. Researchers across the country want to make such a quantum revolution a reality, and the Department of Energy is committed to helping them. Six new Energy Frontier Research Centers (EFRCs) have been established in a multifaceted effort to understand and control the quantum behavior of new materials. These new centers will explore many avenues through the quantum landscape to build a fundamental understanding of how weird quantum properties, such as fluctuations, coherence, and entanglement, manifest themselves in materials and how they might become the basis for new, energy-related technologies. Efforts will encompass the study of existing materials and the discovery of new materials with never-before-seen physical behavior. By understanding the origins of quantum properties, these EFRCs hope to design and control quantum effects, forming the bedrock on which new technologies can be built. The collaborative nature of the EFRCs will bring together researchers from diverse scientific backgrounds to accelerate this process of guided discovery. At the Institute for Quantum Matter (IQM), such discovery is already well underway. Research at IQM is focused on bringing quantum effects from the realm of electrons and atoms to the macroscopic scale. This includes studying the role magnetism plays in other interesting quantum phenomena. Understanding how magnetic properties affect strange electronic materials like superconductors, which conduct electrons without any resistance, and topological insulators, which only conduct electrons on their surface, may give scientists a handle on how to better control these useful phenomena. Other research thrusts at IQM look at even stranger magnetic materials, known as quantum spin liquids. To accomplish this research, IQM hosts a powerful combination of expertise in computational modeling, material synthesis, and advanced analytical techniques. “The EFRC is a unique program that brings together people to address ambitious projects they couldn’t accomplish in isolation,” said Collin Broholm, director of IQM. Such a cooperative approach will guide the discovery of these materials through chemistry and nano-structured materials synthesis. The properties of these new materials can then be analyzed with neutron scattering and advanced spectroscopies to reveal the origins and potential applications of their unique properties. IQM isn’t the only EFRC with an interest in the magnetic and topological properties of quantum materials. At the Center for the Advancement of Topological Semimetals (CATS) topological materials and their magnetic interactions take center stage. Such materials comprise an exciting field of study due to their exceptional transport and optoelectronic properties, topological protection, tunability, and response to external fields, which promise to deliver the next generation of quantum functionalities. Of particular interest to CATS is a class of topological materials known as topological semimetals, which have potential as components in a variety of quantum technologies. To realize this potential, researchers at CATS are investigating the unique properties of topological semimetals and developing strategies to control and manipulate them. Their work encompasses the discovery and characterization of new materials demonstrating topological protection to understand the origins of these properties. The assembly of atomically thin 2-D layers and thin films of topological semimetals into heterostructures with other magnetic materials can deliver new functionality and even induce new topological states of matter. Further, studying how external stimuli affect these materials will give insight into potential future applications. Researchers at CATS hope that such an understanding will let them develop ways to control these materials through external stimuli, including light and electric or magnetic fields. Achieving this kind of control over topological protection has enormous potential in future quantum technologies, including quantum computation, quantum sensing, and more. While IQM and CATS aim to study the magnetic interactions of nanoscale solids, another EFRC wants to go one step smaller to investigate these interactions among individual molecules. Researchers at the Center for Molecular Magnetic Quantum Materials (M2QM) want to push the limits of materials synthesis to use the magnetic properties of individual molecules in new ways. Molecular magnets are particularly exciting, as their physical properties can be tuned very precisely through chemical synthesis. Additionally, molecules of the same type are perfectly identical, minimizing detrimental effects from impurities that often plague quantum systems. Developing molecules that communicate with each other quantum mechanically holds enormous potential for both quantum and classical computing. To facilitate this communication, researchers at M2QM will link molecular magnets together and affix them to solid surfaces, creating new materials with interesting quantum interactions. Understanding how molecular structure governs these interactions is integral in achieving stable, functional materials. By tuning the physical properties of these materials through molecular structure, scientists at M2QM hope to develop new structures able to support advanced computation. The intricacies of quantum magnetism present an endlessly interesting field of research. However, like many other quantum systems, there are major challenges in studying them. Quantum states are often fleeting, making intense study difficult. Prolonging these states is essential for both the study and application of new quantum systems. Quantum coherence is a property that allows quantum states to live long enough to be useful. Understanding the origins of coherence and how to control it is vitally important to realize quantum interactions at the macroscopic scale. At the Center for Novel Pathways to Quantum Coherence in Materials (NPQC), coherence is front and center. Research at NPQC looks to understand the fundamental material structures that control coherence. Unlike other quantum properties where defects are often undesirable, they play an important role in achieving coherent behaviors. Understanding how defects bring about coherence is a major research direction at NPQC. Further, the way defects and imperfections impact other quantum properties, like superconductivity, is under investigation. Materials of interest at NPQC include diamonds embedded with defects, new structures of ultra-thin (2-D) materials, and superconducting materials. The properties of these materials rely heavily on coherence, making them ideal structures to study. The knowledge afforded from these investigations may prove invaluable in bringing quantum properties from the world of atoms and electrons to the macroscopic world. Understanding the intrinsic properties of quantum systems pushes the boundaries of what’s possible in new materials. Just as important is examining how quantum materials respond to stimuli. At the Center for Programmable Quantum Materials (Pro-QM), this is a major goal. Research at the center focuses on developing materials that change their quantum properties in response to stimuli like light or mechanical force. Stimuli response is essential, regardless of the application, and controlling how materials respond could prove useful. Researchers at Pro-QM are investigating 2-D materials as a framework onto which they can modify the properties of solids. Two-dimensional materials are composed of atomically thin layers stacked on top of one another. Modifying this structure brings about unexpected new material properties. “We are largely in uncharted territory with these new materials,” said Center Director Dmitri Basov. For example, offsetting the layers fundamentally changes how the material interacts with light and energy. One promising way to make this change is by rotating one of the layers in the structure. These new structures may allow for tunable responses to stimuli, something that is vital for any application. The fifth EFRC joining the quantum cadre is the center for Quantum Materials for Energy Efficient Neuromorphic Computing (Q-MEEN-C). Researchers at Q-MEEN-C are looking to develop quantum materials able to support neuromorphic computation. This type of computation mimics the way the human brain processes information, dramatically improving the efficiency of certain tasks like voice and facial recognition. “What is amazing about the brain is how much it can do with so little power input,” said Ivan Schuller, director of Q-MEEN-C. Unfortunately, existing neuromorphic computation is nowhere near as efficient as the brain. To achieve brain-like power efficiency, new materials must be found that can behave like neurons and synapses while consuming as little power as possible. Quantum-scale metal oxide materials are interesting, as their electronic and magnetic properties can be controlled with very low energy inputs. Research at Q-MEEN-C looks to delve into the fundamental questions underlying the possibility of energy-efficient neuromorphic computers. Such computers could be game changing in the worlds of machine learning and artificial intelligence. Together, these new EFRCs hold the potential to dramatically advance the frontier in understanding quantum materials. Through strong internal collaboration, these centers bring together diverse groups of scientists from theory, synthesis, and characterization. Directors are even open to the idea of cross-center efforts. “I think collaboration is certainly possible between EFRCs,” said Joel Moore, director of NPQC. Such an influx of new perspectives and ideas is a unique and powerful tool to make scientific progress. The future looks bright for quantum materials, and the groundbreaking research at these new EFRCs lays the foundation for potentially transformative changes to science and technology. The Energy Frontier Research Centers are funded by the U.S. Department of Energy, Office of Science, Basic Energy Sciences. Kenneth Madsen is a Ph.D. student at the University of Illinois at Urbana-Champaign, under the direction of Andrew A. Gewirth, and a member of the Center for Electrochemical Energy Science (CEES), an Energy Frontier Research Center. His research focuses on cathode coatings to stabilize high-voltage lithium-ion batteries.